Wow, a whole year on since Orla had her transplant. It was this evening 12 months ago at around 6pm, the bag of bone marrow arrived into the unit for Orla having travelled a long way from another part of the globe. The bone marrow transplant unit staff turned a blind eye to Ed and I toasting a glass of champagne to ourselves. It was a worthy toast, to have made it that far, but it is arguably more worthy tonight having made it through the months that followed. On the evening of Orla’s transplant and the days while she was in the bone marrow transplant unit it was easy to be in the moment, it was actually a challenge not to be. The days and nights were often measured by the hour and it was all we wanted for Orla to make it through and better still without complications. Fast forward to now and the challenge is to be present, not concerned about the future and what will the effects of the transplant actually be. There are obvious benefits in Orla’s overall health and she is physically stronger but what else does it mean is still to be fully unveiled. Every parent thinks about their child’s future but this is usually with the assumption of their ability to walk, talk etc. Orla saw the metabolic doctors this week, the appointment in some ways felt reminiscent of the day she was diagnosed, we were outnumbered by the number of doctors and health professionals in the room wanting to see Orla as she is unique. This uniqueness still means many questions and minimal answers for Orla and us, other patients with different metabolic conditions the only reference point they have. Whilst the bone marrow transplant team appointments are so positive, from this perspective she is doing exceptionally well, the metabolic doctors aren’t able to provide that same level of reassurance. There are possibly many things that the transplant will not be that good at fixing for Orla in particular her skeletal system. There is already talk of interventions for this and all I can think of is haven’t we been through enough. 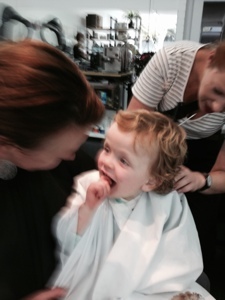 There are no decisions to be made tomorrow or next week so as I said this is a definite challenge for staying present and enjoying life such as Orla’s first haircut yesterday as shown in the photo above!! Hi , You don’t know me and I really , don’t know you . I do however know you through Theo . When he was working with me in Cobar I would often ask how your little girl is travelling . I would be informed that way. Some time back , he emailed me one of your blogs on Orla so I can see a photo of her. May I congratulate you both on your strength on the journey you both have had in the last 12 months . The gift you have , and more importantly , the straight now road the three of you will travel in the future ….. P.S…… nice haircut..